A 76-year-old Hispanic female with no significant past medical history was brought to the Emergency Department (ED) with four weeks of progressive fatigue, shortness of breath and subjective fevers with chills. In the ED, she was noted to be tachypneic and hypotensive. An emergent right internal jugular central line was placed. The patient was admitted to the medical intensive care unit for multifocal pneumonia and septic shock. As shock resolved on day 3, the central line was removed and a PICC line was placed due to difficult access. A slow but continuous serosanguinous discharge was noted from the central line insertion site which later became serous and yellowish as shown in image 1. Serial drainage became progressively cloudy and milky as shown in image 2. What is the cause of this finding? A diagnosis of iatrogenic lymphatic duct injury was made. The fluid analysis was consistent with chyle (lymphocyte predominant (75%), triglycerides of 1194 mg/dl, cholesterol <50 mg/dl, total protein of 1.8, and LDH of 108). 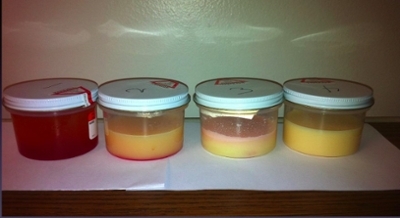 The patient was managed conservatively with NPO and low fat TPN. Lymphangioscintigraphy was performed on day 6, to assess for lymphatic fistula. There was no evidence of lymphatic duct fistula or leak. 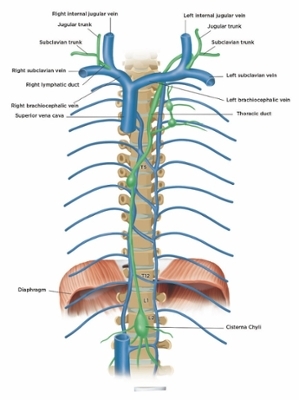 The left thoracic duct and the right lymphatic duct drain into the junction of the internal jugular vein and the subclavian vein as shown in image 3. Most lymphatic duct injuries are associated with left sided catheterization. Our case is a right-sided lymphatic injury and is one of few cases reported. Awareness of lymphatic anatomy and their close proximity to the major vessels may prevent and help recognize injury during central line insertion. Management of lymphatic duct injury requires supportive care with restriction of fats and rarely, ligation of the duct. Saxena P, Shankar S, Kumar V and Naithani N. Bilateral chylothorax as a complication of internal jugular vein cannulation. Lung India 2015; 32: 370-374. Mansfield PF, Hohn DC, Fornage BD, Gregurich MA and Ota DM. Complications and Failures of Subclavian-Vein Catheterization. New England Journal of Medicine 1994; 331: 1735-1738.